A fan agitates for keeping the St. Louis Rams in town during the final home game of the regular season at the Edward Jones Dome on Dec. 17. After years of speculation over which NFL team would be the first to surrender to Hollywood’s siren call, the inevitable finally happened: The league’s owners voted this week to allow the Rams to move from St. Louis to Los Angeles. In his attempt to justify the move, Rams owner Stan Kroenke made a lot of claims about the St. Louis area. He believed, or at least said, his team would be “on the road to financial ruin” if it stayed in the Gateway City because of what he alleged were poor economic prospects for the metro area, a declining population and various other local factors. The kabuki was unconvincing. Kroenke’s arguments rang hollow for a number of reasons, but his silly obsession with the drawbacks of the St. Louis area holds a major logical flaw: The Rams play in the only major pro league where local revenue takes a backseat to the revenue generated by shared, national television contracts. 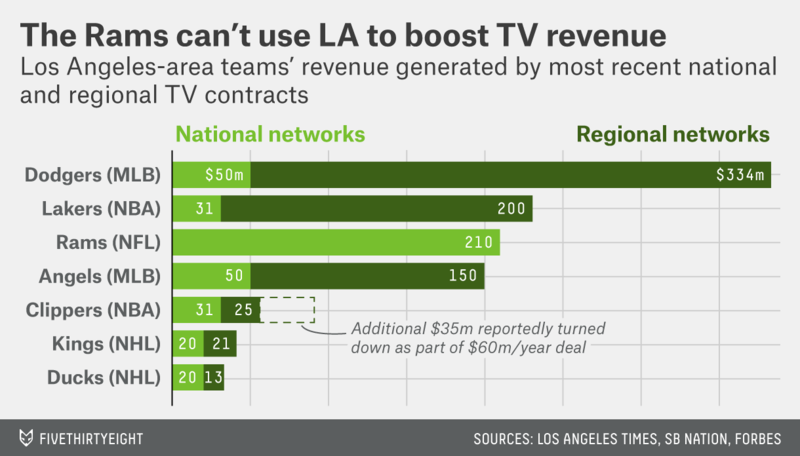 Regional sports networks (RSNs) have been all the rage for a while now, and the profits teams haul in by selling their cable rights — or, better yet, starting their own team-operated channels — have fueled the ballooning revenues in other leagues. In LA alone, the Lakers inked an RSN deal worth an average of $200 million a year,2 and the Dodgers dropped jaws when it was announced their RSN contract would net $334 million per year in revenue. Even the Clippers, who come in well behind the Lakers, recently turned down a $60 million per year local deal, presumably because they’re holding out for something more lucrative. If you’re keeping score at home, that’s 60 percent more TV dollars than the average NFL team rakes in annually. And since the NFL does its television business on a strictly national basis, the Rams can’t unleash the power of an RSN on the eyeballs of the nation’s second-biggest media market. Kroenke would of course argue that the financial benefit comes from attendance — St. Louis was dead last in the NFL this season, and has floated around the bottom three during this decade. But even then, it’s not as though the Rams were always a draw in LA, as the Los Angeles Times noted in a 1994 game story titled “Attendance Is Not Exactly Peachy,” as just 32,969 fans turned out for a 14-12 snoozer against the Cardinals. (This was the “announced” attendance, which is definitionally lower than the actual attendance. Anaheim Stadium’s football capacity was 69,008.) The Rams were last in the league in attendance in 1994, their last year in Los Angeles. So Kroenke gains little in the way of media money by uprooting the Rams, and the benefits to the gate are far from certain once we look to LA’s not-that-distant history as a football town. What then does he gain by fistfighting St. Louis and burning every bridge on his way out of Missouri? One way to make sense of this is to look away from league revenue or fan interest and shift our attention downward, to Stan Kroenke’s pockets. Holy Cross economics professor Victor Matheson told the International Business Times that economists generally expect the Rams’ valuation to rise by at least $500 million with the move to LA. The NFL’s total revenue from national TV rights is a sum of deals with five networks: CBS, Fox, NBC, ESPN and the NFL Network, plus a contract with DirecTV. Disclosure: FiveThirtyEight is owned by ESPN. Hence the figure we list above, a 20-year average from their contract with Time Warner Cable.